When an update for WP User Manager, you will see a notification in your WordPress dashboard. 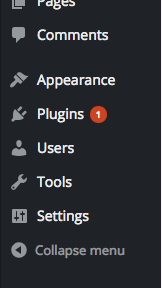 Usually you will also see a number next to the "Plugins" section into your WordPress Dashboard indicating the amount of plugins that need to be updated. Navigate to the "Plugins" page into your WordPress dashboard and locate the WP User Manager plugin. If an update is available, the WPUM section will turn pale orange, and have a red bar on the left edge with a link to update the plugin. Once you click it, a small updating spinner will appear, and then it will say "Updated!". Then your update is finished.